By light microscopy in a loose myxoid stroma a cellular tumor is identified composed of elongated, spindle cells possessing irregular nuclei and an abundant, slightly acidophilic vacuolated cytoplasm (Fig. 2). 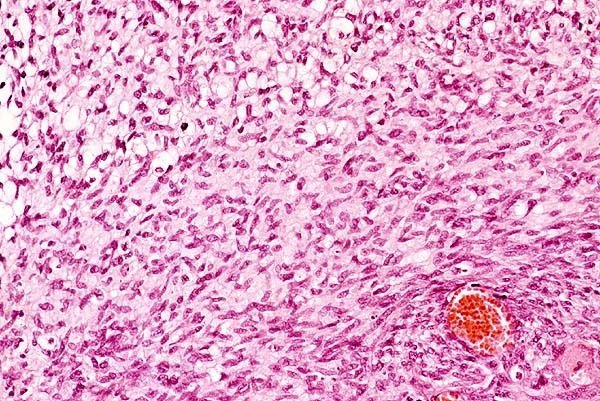 Moderate cellular and nuclear pleomorphism is noted and few mitotic figures, focal hemorrhages and necroses are apparent. 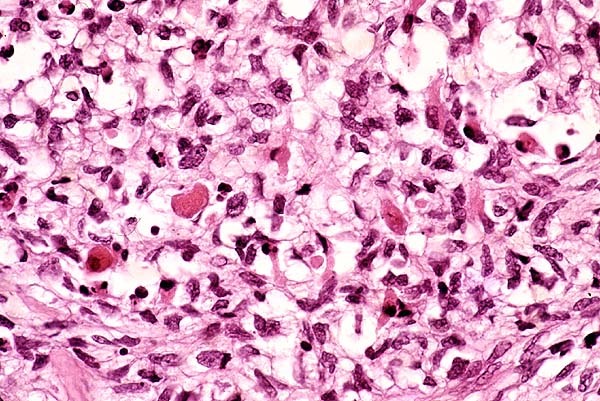 Scattered larger tumor cells with hyperchromatic nuclei are seen showing acidophilic cytoplasm (Fig. 3). 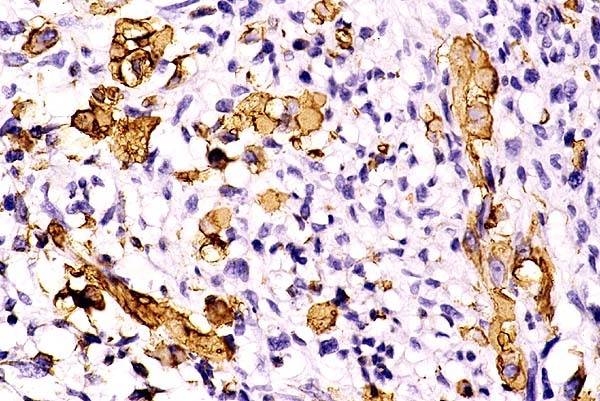 Many tumor cells exhibit strong cytoplasmic PAS positivity which is abolished by diastase digestion. No pituitary adenoma is found. The streptavidin-biotin-peroxidase complex method demonstrates no immunoreactivity for growth hormone, prolactin, ACTH, beta-TSH, beta-FSH, beta-LH , alpha-subunit, neuron specific enolase, chromogranin and synaptophysin, the immunocytochemical markers of endocrine differentiation. Strong and diffuse immunopositivity is noted for vimentin. 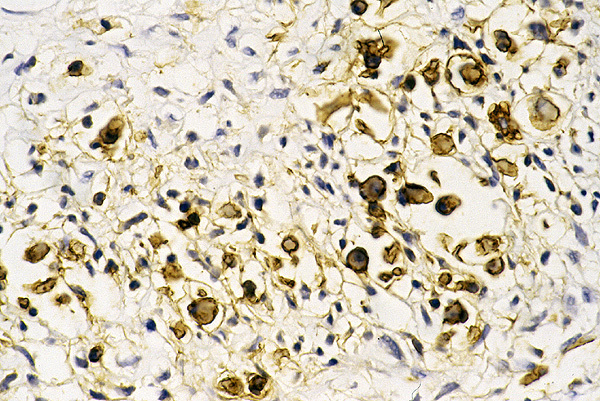 Many tumor cells exhibit positive immunostaining for muscle-specific actin (Fig. 4) and for desmin (Fig. 5). Immunostainings are negative in the tumor cells for neurofilament antigen, epithelial membrane antigen, S-100 protein, glial fibrillary acidic protein, smooth muscle actin and cytokeratin. Electron microscopy demonstrates the presence of thin parallel filamentous bundles in the cytoplasm of tumor cells.